Baby massage has been practiced in many cultures for thousands of years, and research shows many benefits. This guide has been created to give you examples of what you will learn in a massage class. Through baby massage, you can gain increased awareness of how your baby communicates and ideas on ways to support your baby in their first few months. You and your baby will discover what is best for you both. It is important to be mindful that massage is something you do with, rather than to your baby. 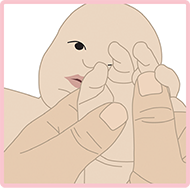 At six weeks baby is starting to become even more responsive, they may be more settled and ready for a fuller massage. Baby massage is a great way to communicate together and introduce fun and play. Here are additional strokes to add to your massage routine. Massage on the back can encourage strengthening of the neck, shoulders and arms as baby lifts their head; as well as having a calming and relaxing effect. There are many ways to position your baby, to encourage them to enjoy being on their fronts. You would learn these different positions on a baby massage class. Lie baby on her tummy and place your hands flat on the top of her back. Then move your hands up and down baby’s back in an alternate, back and forth motion. Massaging the tummy is a lovely way to help baby feel safe and secure as well as helping with tummy troubles such as colic and constipation. If your baby is happy, you can make gentle paddling strokes on the tummy, with one hand following the other. Begin with a resting hand. Make a single downward stroke with your right hand on the left side of your baby’s tummy (your right). Make a backward, sideways ‘L’, going from your baby’s right to left side. Make an upside down ‘U’, going from your baby’s lower right side, up, across and down the left side of the baby’s tummy. Say the words ‘I love you’ as you go through the strokes. Place your baby’s arm in between your two open palms. Gently move your hands back and forth from the top of the arm down to the wrist. Repeat the same motion on the other arm and on the legs. Want to see these baby massage techniques in action? View a demo by watching this video. Gentle massage of the chest can help relieve congestion problems. When sensitively touching the chest, sometimes you will need to pause and with resting hands, share your feelings together. With both hands at the center of the chest stroke out to the sides as if you were flattening the pages of a book. 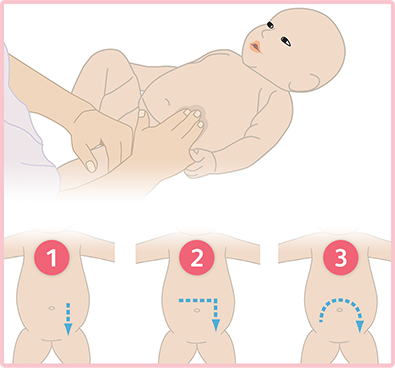 Keeping contact with your baby, glide your hands down, around and meeting in the center again. Touch relaxation can be used at any age and at any time during the massage. Sometimes babies can hold a lot of tension in their bodies and this technique on the arms and legs encourages the baby to relax. Gently mold your hands around your babies arm or leg, asking baby to relax. Using a calm voice repeat the word ‘reeelax’. When you feel your baby responding, reward them with positive feedback, a smile and a kiss. This is a great way to show your baby how to relax the hands. Using the pads of your thumbs gently open their hand, roll each tiny finger between your index finger and thumb and finally stroke the top of their hand from the wrist to the fingertips. Massaging the face can help relax tension caused by sucking, crying and with the discomfort of teething. Babies mirror your movements and expressions. It is a lovely moment to make eye contact and have a happy time together. Make small circles along the jaw with your fingertips. These massage strokes are based on techniques recommended by IMAP (Integrated Midwives Association of the Philippines) and INFANT MASSAGE: A Handbook for Loving Parents by Vimala McClure, the founder of the IAIM (International Association of Infant Massage).